I live in an area called Southwark. For those of us who aren’t British, it is counter-intuitively pronounced “Suth-uck,” rather than “South-wark.” Historically, it was the theatre, gambling, and prostitution epicenter of Central London. While such activity wasn’t permitted under the Queen’s watchful eye, her visual impairment kicked in right around the bank of the Thames, making anything that went on South of its shore virtually unchecked (this is also because Southwark was not part of London proper, making it a separate jurisdiction). 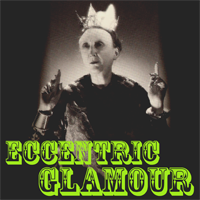 The City of London was particularly suspicious and subsequently, unkind, to theatrical groups within its limits, leading to a large theatrical community in Southwark, where they claimed to “practice” in order to perform for the Queen. Today, it’s where you will find the rebuilt Globe Theater, although the gambling and prostitutes have relocated (hopefully). 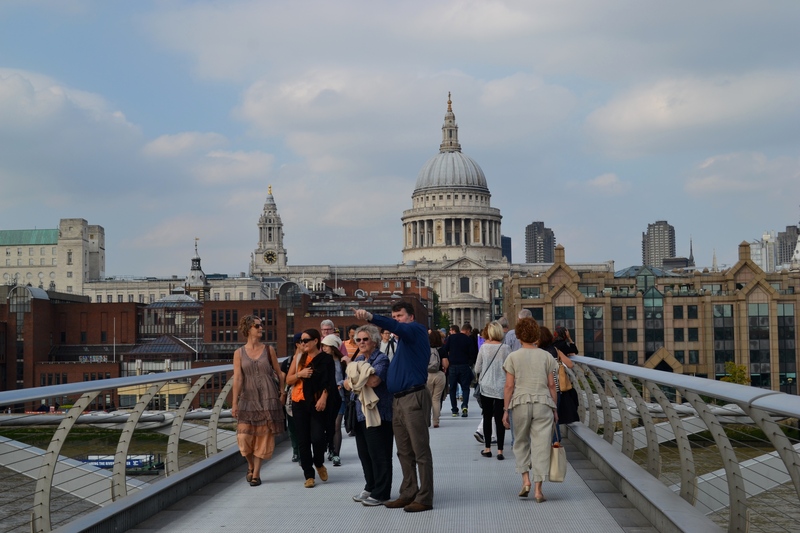 Between the Globe and the installation of the Tate Modern Art Museum, its become a popular area that hosts lovely walks down the Southbank, and scenic views of St. Pauls. This man is pointing at Southwark from the Millenium Bridge. However, before you get to St. Pauls, you have to cross over London Bridge (possibly one of the most boring bridges in London, despite its widespread musical acclaim). And before you reach London Bridge, you encounter a sudden wall of delicious smells cascading from the left side of the street. That pantheon of flavors is none other than Borough Market. Borough Market is the next step up from a farmers market, selling all sorts of fresh produce, meats, and cheeses, in addition to a delicious selection of tempting takeaways. I sampled the salt pork, which I was informed was an “American dish” via Boston. 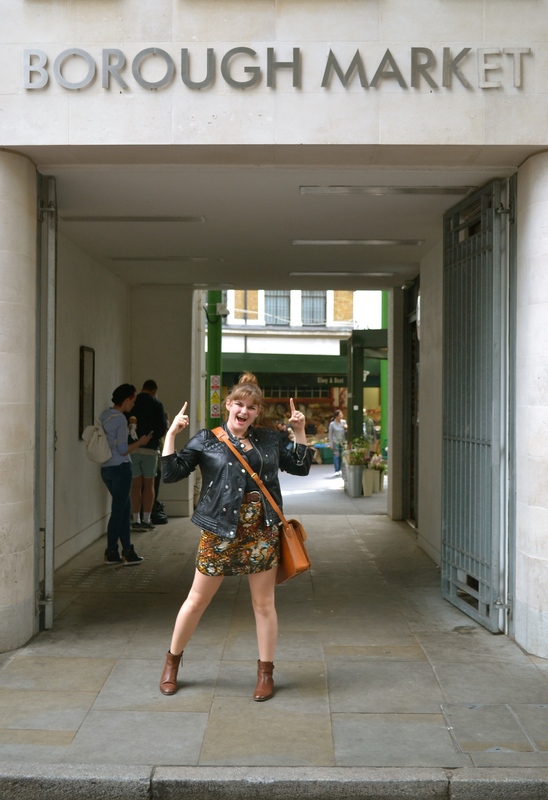 One thing I didn’t realize upon visiting Borough Market is that unlike the farmer’s markets I’m used to back home, people don’t really shops here for their groceries. That isn’t to say no one does, but Borough Market today is a bit of a tourist destination, which has driven prices from the mom and pop tomato stand fares you’d expect to those recognizable in the rest of central London. If you decide to take a visit yourself out-valuing Tesco will not be on the schedule. However, it’s fun to just walk around, and take in the selection, of well, everything. As should be no surprise to those who know me, with a universe of food staring me in the face, while there, I decided to splurge on a coffee. However, this coffee had a recommendation, namely a line spanning out the door (and I’m told, on weekends, well around the block). The brand is Monmouth. Founded in 1978 in Covent Garden (on Monmouth Street), they have grown into three stores that seem to have a cult following. 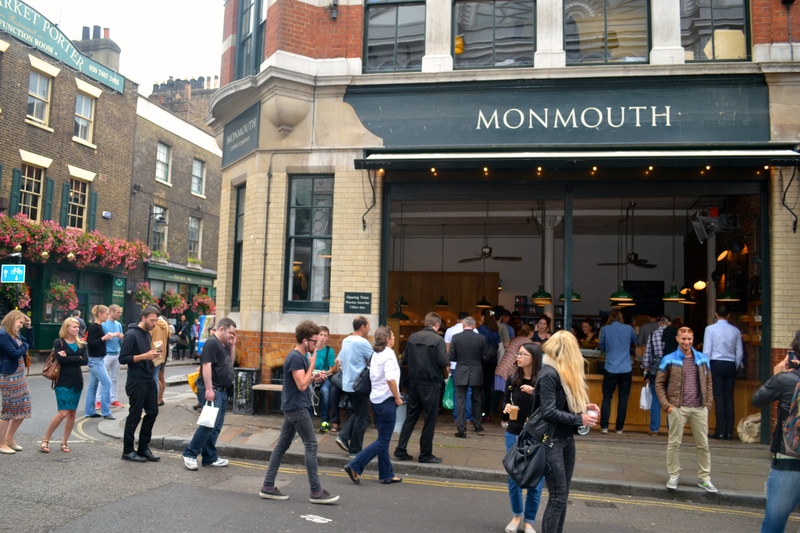 A yuppie playground, Monmouth is not coffee for the weak; if you are prone to headaches, this is not your brew. If you want to stay up half the night doing work to the background of warm, rich flavour this is where to get your beans. Just in from The Clothesline: A Real British Queue. To the sartorial: have you ever seen something that was so crazy that you secretly wanted it (for no rational reason), but told yourself you could never pull it off? That was my relationship with my lion skirt. When I saw it in H&M, it’s combination of quilting and lion heads, I demurely put it back on the rack where it belonged. Undaunted, I returned to best this beast, and here is my interpretation, if you can think of a better way to sport it, let me know below. I’m definitely up for suggestions.